We encourage litter pick ups all year long. It is never the wrong time to clean up Kosciusko County. To help keep people safe we lend out bright orange safety vests and give out brightly colored plastic bags for litter collection. You may also borrow our road signs. Come by to pick up your litter kits anytime during office hours! Did you know the #1 litter is cigarette butts? Gross! Wear gloves and do not pick up anything you deem unsafe. Dewart Lake residents collected an entire pick up full of litter! 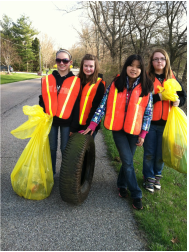 This local Girl Scout Troop had a great day cleaning up Kosciusko! Having a reunion, picnic, or party? 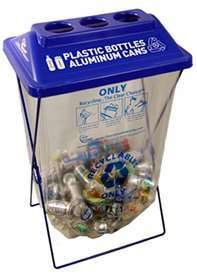 Want to make sure your guests can recycle all their bottles and cans? How about promoting recycling at your sporting event? Stop by and borrow some Clear Stream Recycling Containers to help with your efforts.